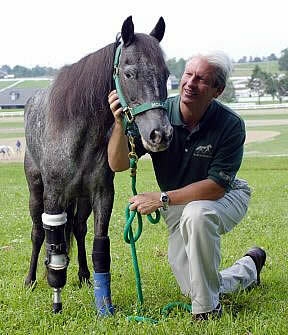 LEXINGTON, KY (April 7, 2010) A rare equine amputee, Molly the Pony, is coming to the Kentucky Horse Park. She was made famous by a CBS News story, after having been rescued by Kaye and Glenn Harris during Hurricane Katrina. Unfortunately, several months later she was attacked by another animal who was rescued after Katrina and who was also experiencing emotional trauma, a pit bull. Although Molly’s other numerous wounds healed, her leg did not make it. Her rescuer and now owner Kaye Harris went to bat for Molly, requesting amputation and prosthesis at Louisiana State University. Successful amputations and prosthetic legs for horses are extremely rare and there were obstacles to overcome, but Molly has adapted well to her new limb and now she visits anyone who could use her quiet wisdom and inspiration. She has impacted and inspired many people of all ages and abilities. A children’s book was written about her and her story has traveled around the world. Molly the Pony, who resides in Louisiana, will be at the Kentucky Horse Park on Saturday, April 17 at the John Henry Memorial Equine Adoption Fair to demonstrate the importance of equine rescue, rehabilitation and adoption. She will make several appearances from 11:30am to 5pm at the New Indoor Arena. The public is welcome to meet this courageous little pony who inspires people everywhere she goes. Park Hours and Rates: From March 15 through Oct 31, the park is open seven days a week. Admission is $16 for adults, $8 for children 7-12. Children six and under are always admitted free of charge. Admission includes the International Museum of the Horse – A Smithsonian Affiliate – and the American Saddlebred Museum & Gift Shop.